We live on a restless planet. Earth is continually influenced by the sun, gravitational forces, processes emanating from deep within the core, and by complex interactions with oceans and atmospheres. At very short time scales we seem to be standing on terra firma, yet many processes sculpt the surface with changes than can be quite dramatic (earthquakes, volcanic eruptions, landslides), sometime slow (subsidence due to aquifer depletion), seemingly unpredictable, and often leading to loss of life and property damage. Accurate diagnosis of our restless planet requires an observational capability for precise measurement of surface change, or deformation. Measurement of both the slow and fast deformations of Earth are essential for improving the scientific understanding of the physical processes, and for optimizing responses to natural hazards, and for identifying potential risk areas. propagation for the 1994 Northridge earthquake. This rendering displays interactions between earthquake rupture and the seismic wavefield and between the wavefield and crustal structure, as well as the nature of surface shaking associated with impinging P and S waves. P waves are cyan and S waves are magenta and are superimposed on the Vs=2.5 km/s isosurface for the San Fernando basin and the LA basin for 25 seconds. Credit: Kim Olsen, University of California, Santa Barbara. Earthquake animation: world map (3 MB). Cumulative global earthquake occurrences from 1960 through 1995. Earthquakes are shown as yellow dots. Credit: NASA / Goddard Space Flight Center Scientific Visualization Studio. Flood animation: Orissa (2.3 MB). This movie, derived from QuikSCAT/SeaWinds Scatterometer data, depicts the 1999 Orissa disaster that affected 15 million people. Two consecutive supercyclones hit Orissa (as shown by the wind field over ocean causing widespead coastal and inland flooding as indicated by dark blue areas on land. Topography contours (500-5000 m, also represented by color from yellow to red) are overlaid on the images to reveal the relationship of inundated areas with local topographic characteristics. Credit: S. V. Nghiem, JPL; G. R. Brakenridge, Dartmouth Flood Observatory, Early Flood Mapping Project, W. Daffer, JPL. Also available is a full-size QuickTime animation (18 MB). Land subsidence animation: Las Vegas Valley (2.8 MB). Animation of land-surface deformation of Las Vegas Valley, Nevada, compiled from interferograms for 1992 to 1999. Seasonal land subsidence and uplift due to ground-water withdrawals and artificial recharge control the vertical deformation and faults contribute to the areal extent and patterns of deformation. Credit: U.S. Geological Survey / Nevada Bureau of Mines and Geology / NASA / Stanford University. Land subsidence animation: Lost Hills (5 MB). Ground subsidence in the Belridge and Lost Hills oil fields, near Bakersfield, California, based upon the 18 year difference between USGS and Space Radar Topography Mission (SRTM) Digital Elevation Models (DEMs). The image morphs between the two DEMs and uses a Landsat image overlay. The vertical dimension has been exaggerated by 300 times for clarity; maximum subsidence was approximately 3 meters. Animation by Vince Realmuto, JPL; data courtesy of Robert Crippen, JPL. For more information contact Vince Realmuto. Magnetic dynamics animation: radial component (2 MB). 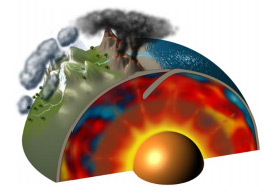 The radial component of the magnetic field at the core-mantle boundary (CMB) is determined from Oersted observations. Credit: Jeremy Bloxham, Harvard University. Sea level changes animation: Pacifica (4 MB). During the 1997 to 1998 El Niño season, California's coastlines experienced severe erosion resulting in millions of dollars worth of damage. The before and after images above show coastal erosion near Esplanade Drive in Pacifica, California from 1997 to 1998, from airborne laser altimetry data. Credit: NASA/Goddard Space Flight Center Scientific Visualization Studio. Photo courtesy of U.S. Geological Survey. Sea level changes animation: Pine Island Glacier (5 MB). A model-based simulation of Pine Island Glacier, the most active glacier in Antarctia. It accelerated 18% in 8 years over a length of more than 150 km, causing ice to thin 13 m, and it's line of floatation to reterat 6 km. Animation by Vince Realmuto, JPL; data courtesy of Eric Rignot, JPL. For more information contact Vince Realmuto. Tsunami animation: Honolulu (5 MB). This animation simulates tsunami inundation of the area from Wakiki beach to downtown Honolulu after a local 7.4 earthquake. Such simulations utilize wave propagation, runup, and inundation computations in order to predict tsunami behavior and determine the best evacuation routes. Credit: Gerard Fryer, University of Hawaii at Manoa / Pacific Disaster Center / NASA. Volcano animation: Mt. Etna (4 MB). This animation depicts ground deformation associated with magma intrusion at Mount Etna, Italy. The steady inflation of edifice occurred from 1993 to 1995 and cultiminated in resumption of eruption activity in late 1995. Ground deformation data are derived from Diff. Radar Interferometry and is represented by color contours. Ground deformation predicted by Point Source (Mogi) Model is represented by animated deformation of Digital Elevation Models. Ground deformation has been exaggerated 30,000 times, and the maximum inflation of the edifice was 12 cm. Animation by Vince Realmuto, JPL; data courtesy of Paul Lundgren, JPL. For more information contact Vince Realmuto. Volcano animation: Mt. Kilauea (4 MB). This Animation shows the Kamoamoa lava flow on Mt. Kilauea in Hawaii spreading towards the ocean. Data in the forms of visible, infrared and thermal infrared imagery was acquired using the NASA C-130 remote sensing research aircraft between September 3 and 17, 1995. The combination of image and elevation data results in the visualization of interaction between the local topolographic gradient and the velocity and morphology of the flows. Credit: V.J. Realmuto, S.L. Adams, Z. Gorjian, JPL. Also available is a full-size QuickTime animation (29 MB). For more information contact Vince Realmuto.